Book Kuwait cheap air tickets through Brightsun Travel. Call 0124 416 3000 now! Kuwait is one of the most fascinating destinations in the Persian Gulf. This tiny country boasts dazzling skyscrapers, incredible mosques, modern shopping complexes, contemporary museums and much more. 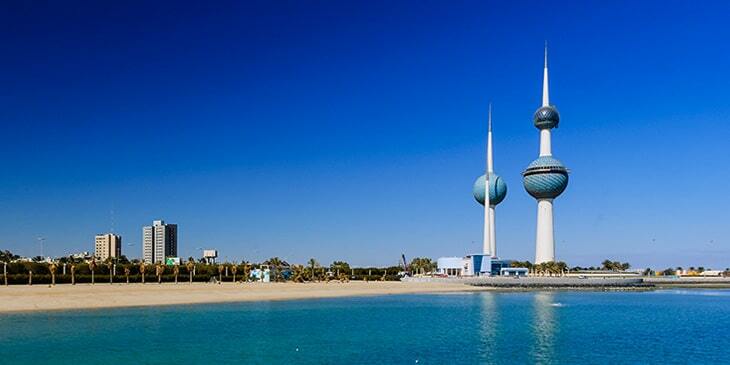 Kuwait is also a land of several stunning landmarks; visit one of the world’s tallest towers, Kuwait Towers and admire its distinctive blue-green sequins and bulb-shaped design. Another must-see icon of Kuwait is the country’s largest mosque, The Grand Mosque made from Italian marble, French glass and Indian teak wood; you will be stunned by the mosque’s gold-plated central dome, Moroccan mosaics and German chandeliers. There is so much to do for fun in Kuwait; go scuba diving at Kobar Island, kayaking in Salmiya and snorkelling at Umm al-Maradim Island. If you’re a wildlife lover, visit the iconic Kuwait Zoo to spot more than 1800 species, including ring-tailed lemurs, wolves, olive baboons, chimpanzees and striped hyenas. Brightsun Travel can help you organize Kuwait flights from India, so you can look forward to an amazing trip with lots of epic experiences. Kuwait is an excellent museum hub with boundless impressive venues to explore. The top must-visit museum of the country is the Tareq Rajab Museum, home to Arabic manuscripts, musical instruments, necklaces, royal costumes, Mongolian helmets, Bahraini pearls and Omani silver and Saudi gold jewellery. You can also step inside the Al Qurain Martyrs’ Museum to discover a collection of weapons, including tanks, AK-47 rifles and shotguns. Another captivating museum worth visiting here is the Kuwaiti Maritime Museum which displays huge wooden ships, dhows and various objects used in the pearl industry. Then there’s the Historical, Vintage & Classic Cars Museum where you can admire a range of vintage cars used by several dignitaries, including US President Eisenhower, Queen Elizabeth, and the Emir of Kuwait. Finally, why not visit the KOC Ahmad Al Jaber Oil & Gas Exhibition in Al Ahmadi to learn about the exploration, extraction and export of oil. Brightsun Travel offers a range of discounted airfares to Kuwait, so you can come and explore the country’s rich history and cultures for yourself.